But the only reason I find those flaws disappointing is because I’m so behind him on his main points, and want them to get a fair airing. Below I’ll attempt to distill the most important themes down to a summary, but by all means to do his ideas justice, grab a copy of the book. Theme: There are multiple valid levels to systems. Complex systems can be analyzed from many different levels. For example, at the low level, we find the interaction of particles in a seemingly deterministic way pushing causal chains one way or another. Yet we usually think and talk about things on a higher level, for example the symbolic level in which I represent and conceptualize myself and other people (onto which I intuitively attribute causal power). Hofstadter wants us to really recognize that these levels can coexist simultaneously, and both accurately describe the system. This is essentially a forest/trees distinction, but applied to a more personal domain: our selves. Our brains are made up of low-level neurons (and lower-level particles), but also contain or effect high-level symbols (dogs, Norway, friendship, Caesar, myself). These two levels seem to compete. We intuitively see the symbol level as real and causally potent: when I get in a car and drove to the grocery store, my desires and my thoughts or memories of particular foods are causing the car (essentially a huge chunk of metal) to move. All this despite the fact we all acknowledge that underneath this scene is a bunch of physical particles churning along by mechanical (perhaps probabilistic) rules — so in fact, the car is moving because of the interactions of countless unconscious, unmotivated particles. On some level we know this is where the real causal power is at, but at the same time, we are struck by the intuitive pull to say that those upper levels (my thoughts and motivations) are controlling things. How do we address this paradox? Hofstadter’s insight is to pull a solution from an analogous problem found in an unlikely place: the rigorous formal systems of mathematics. Specifically, he explains how Kurt Godel’s Incompleteness Theoroms demonstrated that the tight, formal, carefully-defined, low-level mathematical system of Russell and Whitehead’s Principia Mathematica could be seen at the same time on a higher-level where numbers could in some sense make claims about their own provability (even paradoxical self-referential statements like “this statement cannot be proven”). The mathematical details are interesting, but not important for Hofstadter’s larger point, which is that the different levels of interpretation are just as valid and real, as long as they have referential stability. Godel showed that the symbols of Principia Mathematica could be used not just to make low-level statements about number theory (like “1+1=2”) but also high-level statements about the provability of its own statements, because those high-level statements were not arbitrarily tacked on as meanings to the symbols, but were mapped on in a way that represented the inherent structure already there. Theme: An unavoidable and useful illusion. In the end, though, Hofstadter argues that this “I” level, the level of symbols we are all familiar with, is a sort of illusion, and one we are stuck with. But because of the referential stability — because the mapping works so well — it is a useful illusion. After all, how inefficient would it be to converse about politics across the world if everything just boiled down to the swirling of trillions of interacting protons, neutrons and electrons? How well would a creature survive that didn’t interpret a looming orange-and-black-striped blob of color as a hungry tiger but instead as just a bunch of particles? The higher level is where we live and breathe and act, and it works, as long as we also remember that beneath it all is the physical particle stuff. The “I” comes out of the structure of the lower-level, but in turn the entire system (the “I” level) has a tangled hierarchy of feedback loops wherein it informs the lower level. Theme: Structure can be reproduced to some extent in other mediums. In this book, Hofstadter also steps away from the abstractness of Godel, Escher, Bach and addresses the issue from a more personal angle, reflecting for some length on the loss of his wife and how this worldview informs that. If a large part of what we are — the self, personality, “I” — is really just patterns and structure and self-representation built up from lower-level processes (and not some mystical soul that is separate from matter), then he wonders if the essence of those systems may in some sense be represented (with more or less fidelity) in other representational systems. In other words, he wonders if the incredibly full and complicated representation of his lost wife that exists in his head is actually, in some significant sense, an instantiation of her self, of her “I”? Does she, in some fuzzy sense, live on after her death, inside his head? That is the claim he ends up making. Through various intuition pumps (including imagining a world where everyone is a siamese twin and the concept of an individual — a half-person in their world — is unusual), he attempts to make this claim plausible. Whether or not you agree with him will probably come largely from the argumentative power you grant analogies, which Hofstadter is a master of. He wants to convince us that the one body = one mind = one identity assumption we operate under is in fact only a rough approximation. In fact, he says, we have little pieces of ourselves — of our “selves” — scattered around in others. If somehow we fully shared all of our experiences and sensations and perceptions (saw through the same eyes, felt the same touches, heard and read the same words), we would eventually become roughly the same person. Obviously one could argue against this last claim: that a small change in the initial variables (i.e. early life, genetics) propogates too widely to make complete overlap of experience possible. But Hofstadter isn’t really saying that we become exactly identical (though he verges on such language in his more flowery/emotional passages), but that we at least hold some courser-grained version of someone’s self-representation inside us. In some sense, when we know someone extremely closely we partly become them by stepping in their shoes, putting on their glasses, getting into their head, and basically thinking and experiencing like they do. It’s an odd and counter-intuitive vision of distributed identity, which brings up all sorts of questions about the fuzziness of memory and cognition and representation when it is distributed across so many different brains, so many different representational systems. Honestly, I don’t think he tackles the implications of his musings very deeply on this subject. But then, such analytical work is worthwhile only if the ground work is laid first by a change in the big picture perspective. It’s that big-picture shift which Hofstadter is aiming for here. If you’re looking for a relatively quicker, simpler or more personal introduction to Hofstadter’s ideas, check out I Am a Strange Loop. 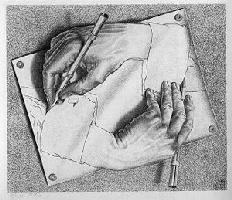 But for a broader, more in-depth, and more fun treatment of the subject, I still suggest Godel, Escher, Bach as an amazing book examining how consciousness and “I”-experience could come out of inanimate matter. This entry was posted in Uncategorized and tagged consciousness, identity, philosophy. Bookmark the permalink.